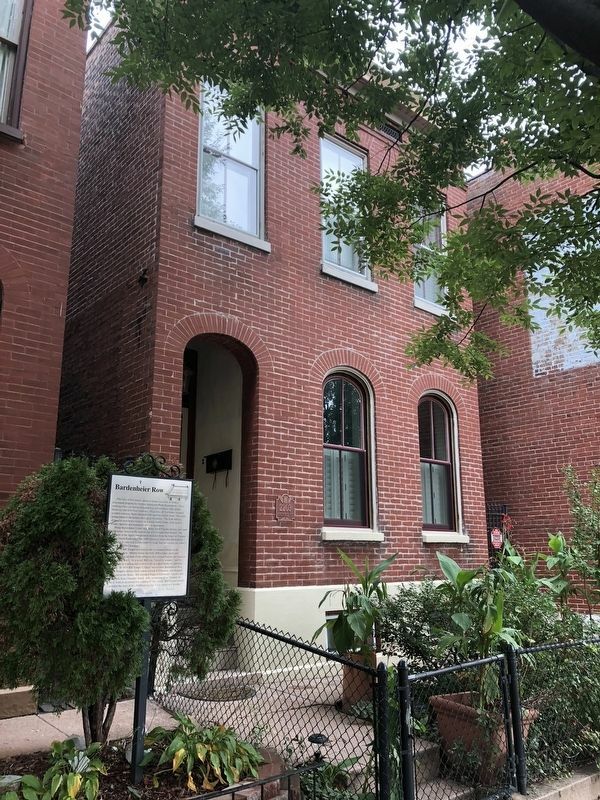 This row of five almost identical homes was built in 1884 as investment property by German immigrant Philip Bardenheier. These working-class city houses featured recessed entrances, fully arched doorways and first floor windows. Originally, all five homes featured wooden cornices, likely trimmed with machine-milled wood. The room arrangement of the homes offers great flexibility. The front hallway allows for each house to serve as a single family home, or be used as distinct upstairs and downstairs flats or apartments. Philip Bardenheier's own large home faced Virginia Avenue, just south of Meramec Street on the current site of Cleveland High School. The vineyards of the liquor entrepreneur stretched from the house on Virginia west to Grand Boulevard. The 1899 Directory shows that Bardenheier's son, Philip Jr. who was a piano tuner by trade, had moved into his father's property at 2209 Cherokee. Bill was "raised by women," and his mother took in washing and went to work as a pressfeeder at a printing company. 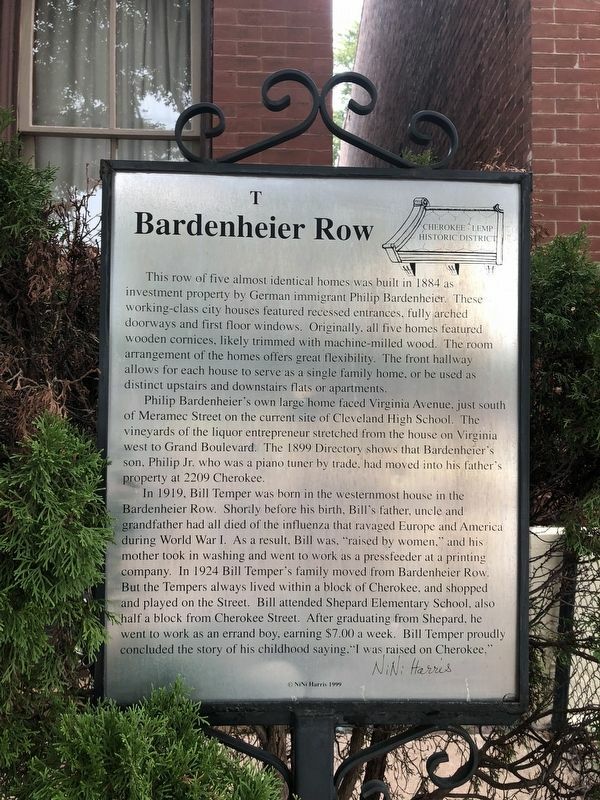 In 1924 Bill Temper's family moved from Bardenheier Row. But the Tempers always lived within a block of Cherokee, and shopped and played on the Street. Bill attended Shepard Elementary School also half a block from Cherokee Street. After graduating from Shepard, he went to work as an errand boy, earning $7.00 a week. Bill Temper proudly concluded the story of his childhood saying, "I was raised on Cherokee." Location. 38° 35.588′ N, 90° 13.409′ W. Marker is in St. Louis, Missouri. Marker is on Cherokee Street west of Missouri Avenue, on the right when traveling west. Touch for map. Marker is at or near this postal address: 2205 Cherokee Street, Saint Louis MO 63118, United States of America. Touch for directions. Other nearby markers. At least 8 other markers are within walking distance of this marker. 2201 Cherokee (a few steps from this marker); 2215 Cherokee (within shouting distance of this marker); The Birth of Antique Row (within shouting distance of this marker); South St. Louis Architect (within shouting distance of this marker); 2225 Cherokee (within shouting distance of this marker); Life In The Fifties (within shouting distance of this marker); 2301 Cherokee (within shouting distance of this marker); The Cigar Store (within shouting distance of this marker). Touch for a list and map of all markers in St. Louis. More. Search the internet for Bardenheier Row. Credits. This page was last revised on October 11, 2018. This page originally submitted on October 9, 2018, by Devry Becker Jones of Washington, District of Columbia. This page has been viewed 39 times since then and 7 times this year. Photos: 1, 2. submitted on October 9, 2018, by Devry Becker Jones of Washington, District of Columbia. • Andrew Ruppenstein was the editor who published this page.